Schools in our Adopt A River Schools (AARS) program implement a comprehensive river program at their school and at their adopted site along the Chicago River. They commit to visiting their adopted site at least twice a year - most do more - to gather scientific data on water quality (both chemical and biological) and habitat. Each school is required to have an active team of two or more teachers to serve as leaders. What are the requirements of AARS membership? 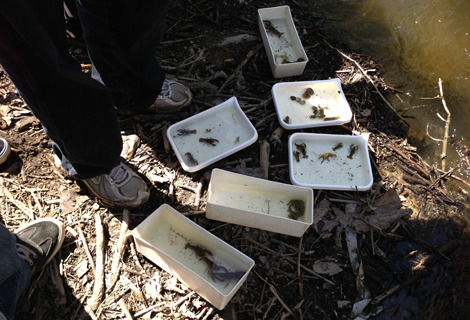 Monitor the Chicago River’s water quality at your school's adopted site. Share your water quality data online, via the Watershed Community Report. Students complete Pre- & Post-Trip Surveys. Teachers complete an Annual Evaluation. Implement a service-learning project or participate in our annual Chicago River Day event. Celebrate the Chicago River by participating in our annual conference, the Chicago River Student Congress. If this is of interest, please complete the AARS APPLICATION and send it to us. How does Friends support the AARS program? Friends hosts annual trainings for teachers, has water quality equipment to borrow, provides a small grant program, and offers support and networking opportunities throughout the year. Non-CPS Schools: Chicago City Day School, Deerfield, Loyola Academy and Maine Township High Schools. View a map of Adopt A River School sites.